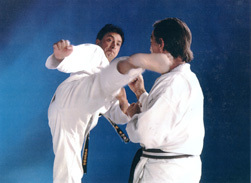 Our instructors have many years, often decades of experience, in teaching martial arts. Our two main types of practice are Shotokan Karate and Kobujutsu. A Karate lesson starts with the exercise warm up and then gently stretch the body. As effective karate is achieved by body co-ordination, a lot of time is given to basic blocks, hand attacks and kicks, concentration on correct breathing and body control. These basics are later put into pre-arranged sequences of attacks and defence, again using perfect control, so that injuries may never occur. The Shotokan Kata (set forms) are the most spectacular form around and are the foundation of the fighting system, the later part of each lesson is therefore dedicated to kata. The lesson normally finishes with a few exercises to condition certain parts of the body, followed by final light stretching and breathing exercises. To start with a tracksuit and a tee-shirt or similar loose clothing will do. If you then decide that you wish to continue training, then the club can provide, or advise you on obtaining a karate suit called a gi.